The New Moon occurs at 09:50 (BST) on April 5, 2019 at 15°Ar17′. The first New Moon of the astrological year tends to be a time geared towards new beginnings. Aries is a sign associated with spring. It’s fiery, passionate, hot-bloodied, impatient, up for a challenge and raring to go. 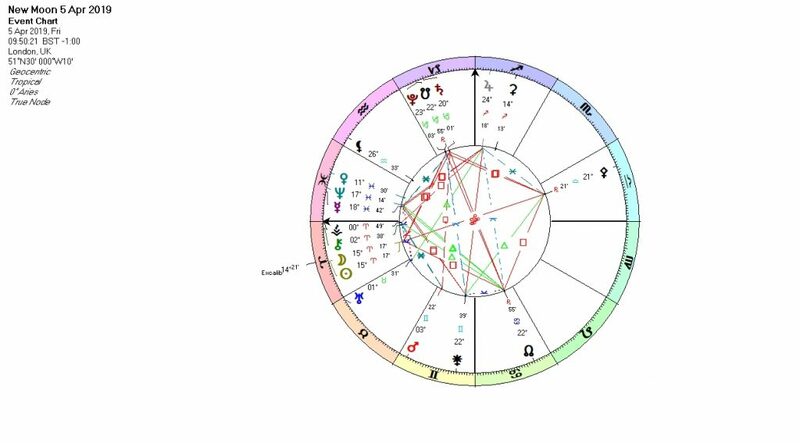 This chart is full of cardinal energy with Uranus being the only planet in a fixed sign (Taurus). Given this pattern then, it feels like being at the starting line of a race, engines revving, pumped up, eager to beat the competition. But the starting gun doesn’t fire and there’s a red flag waving. We can’t go anywhere until we’ve dealt with unfinished business. The New Moon squares the conjunction between Saturn and Pluto on the South Node in Capricorn. Right now, there is no escaping the consequences of past actions. We need to learn from our history, reconsider our approach and get real! Maybe there are rules that we need to comply with before starting a new project. Whatever it is, we have to slow down and consider all angles before hurtling after our goals. One of Aries’ main faults is that it struggles to finish what it starts. The burning passion that puts a rocket under us at the beginning can burn out fast. What we need to complete a job is fixed energy, exactly what is mostly missing from this chart. The Saturn restraint then on this New Moon is a blessing in disguise because we’re forced to investigate whether our new beginning has staying power and whether we’re committed enough to see it through to the end. Pluto’s involvement in this picture pushes us to face our fears instead of trying to run from them in the hope that they won’t catch up. We need to slow down, consider the problem and approach it with maturity. 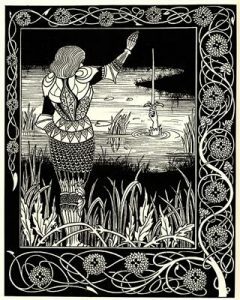 Asteroid Excalibur conjunct the New Moon is a perfect analogy of the squares to the Capricorn trio. The sword in the stone won’t budge until the time is right and we are ready to take the lead. The cause must be just, and we must be sovereign to wield such powerful magic. What is begun now has the potential to become a long running saga. We need to be ready, willing and able. The Moon is trine to Ceres which suggests that there is a chance for this New Moon energy to become fruitful in the end. We must nurture our courage and our vision. More complicated is the Moon’s very wide opposition to Pallas, herself squaring the Nodes, Saturn and Pluto. Diplomatic relations right now are strained but work together we must. Aries is a self-starter, compelled to act on its own behalf but with Pallas in this position, we must look for win-win scenarios. Mars, ruler of this lunation, is travelling through Gemini and sextile to Chiron. It’s about debating points without resorting to wounding with words. We need to be open to taking advice from teachers and mentors and willing to check the facts. Remember that Mercury is still in the shadow zone after last month’s retrograde and still conjunct Neptune. There’s lots of imagination here but we’re still tempted by wishful thinking and could be swayed by false promises. It’s important that we are clear and direct about our intentions. Hopefully Saturn’s placement in this chart will keep us anchored to reality even if we don’t like it! Just as the light fades, help appears. It’s like the knight in shining armour arriving at the eleventh hour. Sometimes it takes a challenge to deepen our spiritual awareness. Even when you think you’re doing everything alone, invisible helpers support your every move.